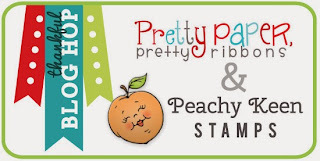 Hello and welcome to the Pretty Paper, Pretty Ribbons and Peachy Keen Stamps Thankful Blog Hop! With Thanksgiving just around the corner the Designers from each blog have created some lovely projects focusing on thankfulness. We've used products from both of these fabulous companies to create our projects and can't wait to show you what we've made! You should have arrived at my blog from GiGi's Blog at The Cricut Bug. If you just stopped by for a visit and would like to start at the beginning of our hop, just head on over to Lisa's Blog at Pretty Paper, Pretty Ribbons. I recently kept all 4 of my grands for a few days and took the opportunity to squeeze in a photo shoot! It was no small task to get them all looking at me and (somewhat) smiling at the same time. I took about a gazillion photos and managed to get more than a few keepers! 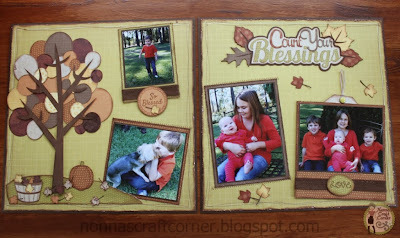 * I also hand cut a journaling tag to slide behind the photo of all 4 grands. I used pop-dots on the mat of this photo so that the tag would slide in easily. The above photo shows the tag pulled out. Thanks for letting me share my sweet little blessings with you! 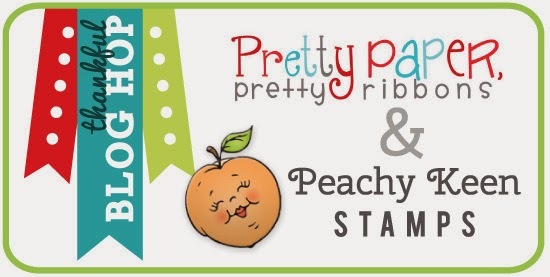 Now, before I send you on your way, I wanted to let you know that both Peachy Keen Stamps and Pretty Paper, Pretty Ribbons will be giving away a $15.00 Gift Certificate to help celebrate today's Hop! Be sure to leave a comment on each stop along the hop and leave your email address in your comment so that you can be contacted if your name is chosen! Great LO and a perfect title for your pictures. Love the papers used for the pages. Great coordination and placement. Thanks for sharing. Sweet lay-out of some sweet looking little kids! So beautiful Tanya... love all the layers and love. Tanya ~ the title of this LO couldn't be any more PERFECT! Of course all the details are AMAZING but I so LOVE seeing those blessing you have there! BEAUTIFUL grandbabies and beautiful project!!! Such a pretty LO, Love all the details especially the Tree. It's perfect. Great layout. I love your title with the leaves around it and the little tag that sticks out of one of the pictures. Perfect for journaling. Very cute layout. Your Grandchildren are adorable. Nice journaling. 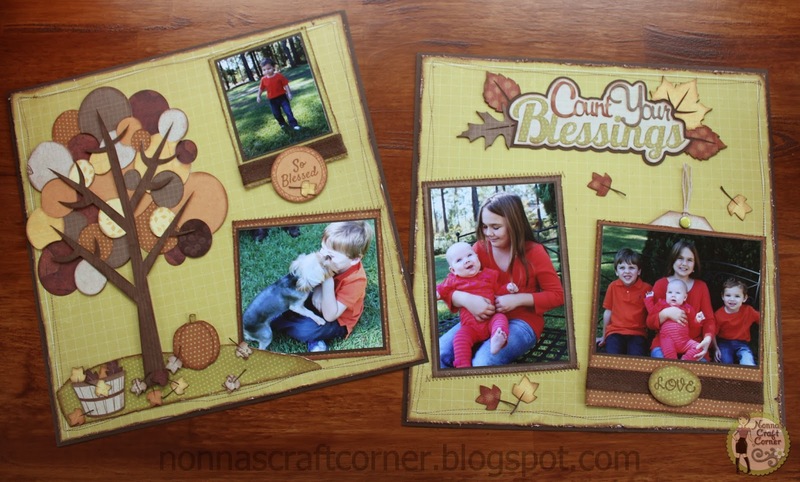 Such a cute layout and beautiful grandchildren! You have such a beautiful family Tanya, and it's easy to see why you are so grateful for them. This layout is AMAZING and captures the love in your family perfectly!!! Beautiful work as always! I adore that smiling grandbaby picture! You are blessed! Wonderful LO of your beautiful grandkids!! Looks like you had a fun day! Oh how gorgeous...grands and layout! Such a beautiful tree and love the stitching!!!! Fabulous my friend! Great layouts - love the tree. Gr8t job on your L/O!!! That is a beautiful layout! I LOVE IT!!! You are so talented sweet friend!!! So great to be a part of this hop with you! This double LO is gorgeous Tanya!!! First of all your grands are too adorable and I bet they LOVED spending all that time with your guys!!! You did an amazing job with the files, the stamps and designing this precious memory! These pages are stunning. You picked the perfect colors and shades to let the photos be the focal point. Love everything about these pages. Your layouts are fantastic Tanya! 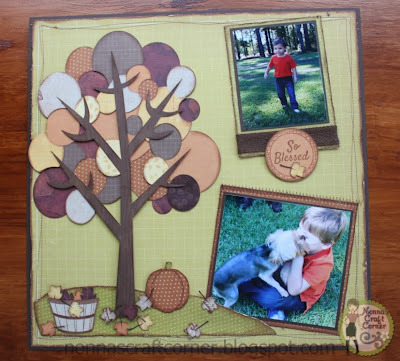 I love the big tree and and fun title-the scene is fabulous and then to top it off with these ADORABLE pics! Your Grandchildren are so sweet and just adorable! So glad you shared:) LOVE it!!! I'm just blown away as always by your work, but when you include photos of your sweet little ones, that's just icing on the cake of perfection! Love it, Tanya!! Tanya what a beautiful layout. LOVE LOVE LOVE your tree. Love the tree! Great LO. Very sweet idea. I should do this with my grandkids. Tanya your layout is just stunning!! 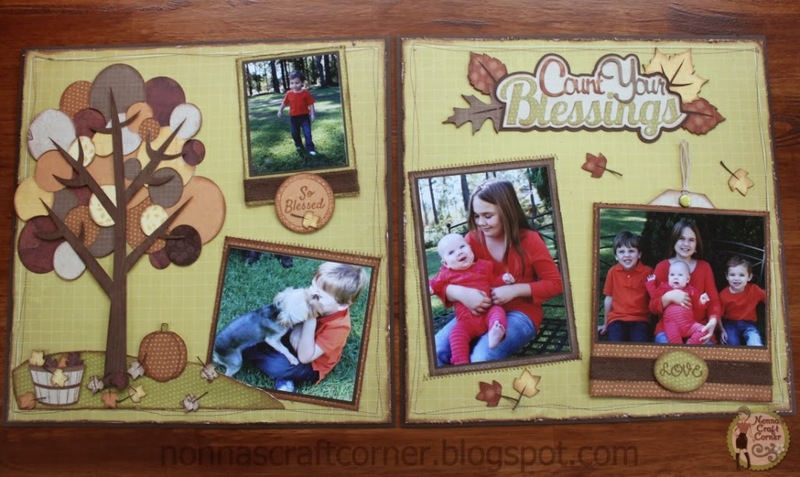 Your pictures are so adorable and I love the files you used :) your grands are so sweet!! Sweet job on your layout pages. A wonderful job of mixing Peachy Stamps with PPPR cuts. Gorgeous layout Tanya. I love the beautiful fall scene you set. The pictures are adorable, especially the one with Lola!! this is sooo gorgeous, Tanya!!! love it!! and your grandchildren and beautiful, of course! !